I read an article, “Black-Eyed Peas the Way Your Grandma Used to Make Them” and the problem is a: my grandma didn’t make black-eyed peas and b: if she did, she probably would have made them with pork or bacon like the article recommended. I’m not from the south, so I can’t say if this recipe is traditional, but the article said to use thyme, oregano, bell peppers, onions, garlic, tomatoes and celery to make a gravy. I winged this one and it turned out delicious. Not sure if it tastes at all like the black-eyed peas you may remember, but I can say it tastes good. And…it should bring a little good luck if you eat it on New Year’s Day! Pour dried black eyed peas into a covered pot and fill with water at least 2 – 3″ above the dried peas and soak overnight. Drain soaked peas and rinse, set aside. In pressure cooker, heat olive oil and add garlic, onion, celery and peppers, simmer until soft and slightly caramelized. Add all other ingredients but the peas and water, simmer for 10 – 15 minutes to mingle and mix spices and flavors. Add peas, pour in enough water to barely cover the tops of the peas. Follow instructions on your pressure cooker for preparing soaked black-eyed peas and cook until soft. Mine take about 15 minutes. If you don’t soak your peas, you will need lots more water and the flavor will be diluted, so I can’t say how this will taste. If you use canned peas, you can prepare the ingredients on a stovetop, add and heat the beans – no need to pressure cook. 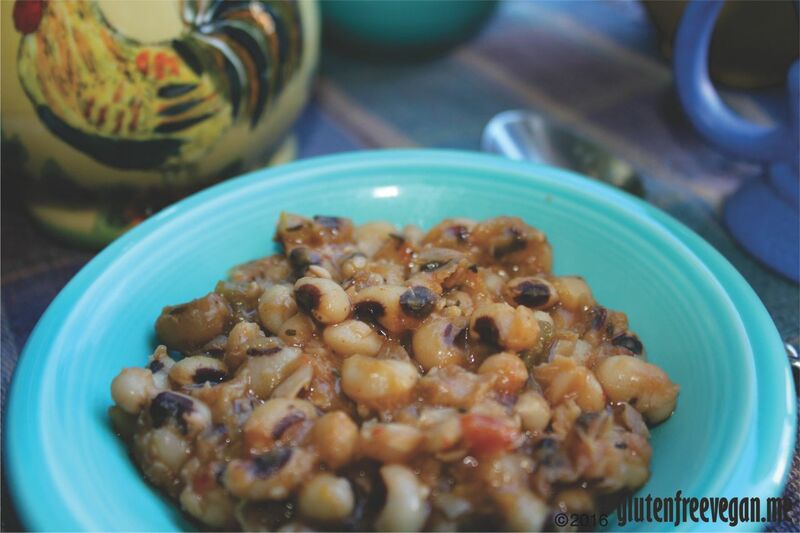 Wishing you much luck and a tasty pot of black-eyed peas in the New Year! This entry was posted in main dishes, Recipes, side dishes, Vegan Information and tagged black-eyed peas, gluten-free, gluten-free vegan recipe, glutenfreeveganme.com, healthy, new year's vegan, vegan, vegan cooking, vegan recipes, vegetarian black-eyed peas, veggies. Bookmark the permalink.